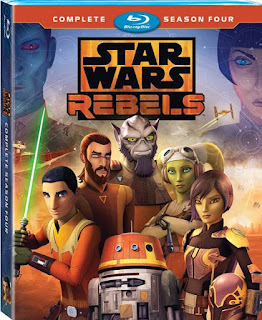 We're giving away five (5) Blu-ray/DVD copies of Star Wars Rebels: The Complete Fourth Season, courtesy of Disney XD; and all you have to do is provide your name, email and mailing address... No trivia questions, running through hoops, etc.. How easy is that? We'll select five winners (one DVD per household) and ship your prize via FedEx or USPS (after July 31st.) All entries must be received by Saturday, July 28th at 11:59 PM EST, so act fast. Good luck! Synopsis: Star Wars Rebels: The Complete Fourth Season delivers all 15 action-packed episodes of the hit CG animated series’ final season, plus exclusive, never-before-seen bonus extras on Blu-ray! Star Wars Rebels: The Complete Fourth Season is available on Blu-ray/DVD, Tuesday, July 31, 2018. Click here to purchase online.